The legend of King Arthur has been told and retold in many forms over the past fourteen centuries. In the last hundred years, the "Matter of Britain" has inspired works in new forms of cultural expression, including motion pictures, television, and comics. These web pages are an attempt to provide scholars, enthusiasts, and other interested parties with an overview of the various comic strip and comic book series that have featured Arthurian themes. I acknowledge that this overview is incomplete (especially in regards to non-American comics), and suggestions for additions are more than welcomed. For a more comprehensive and scholarly approach to one major segment of Arthurian comics, I enthusiastically recommend Michael Torregrossa's "Camelot 3000 and Beyond: An Annotated Listing of Arthurian Comic Books Published in the United States c.1980-1998", originally published in the journal Arthuriana and now available on the Web. Michael also maintains another web site devoted to the topic, the Arthur of the Comics Project. Yet another great online resource is Rodney Parrish's "Camelot Illustrated", or "King Arthur in Comics", an alphabetized list based on Rodney's own collection. Finally, the single most comprehensive bibliography of Arthurian comics -- and all Arthurian works in English over the last 750 years -- is Daniel P. Nastali and Phillip C. Boardman's two-volume The Arthurian Annals, published in 2004. The information on this site is based on primary sources (the author's personal comics collection, for the most part) except as noted, with the exception that some of the publishing history for a few series is derived from the Overstreet Comic Book Price Guide. More details are provided on the sources and resources pages, but I do want to note here the contribution of Robert Vermaat, who provided information on European comics that would otherwise have been unavailable for this project. Robert maintains the Vortigern Studies site which should be of interest to anyone curious about the "historical Arthur". The bibliographic efforts of Michael Torregrossa, mentioned above, as well as the information gathered by other collectors or scholars like Daniel Nastali, Rodney Parrish, Jason Tondro, Scott McMahan, and Orville Eastland has also been very helpful. I am aware that some users of this resource will be more familiar with the Arthurian legend than with comics and vice versa. While a thorough discussion of either topic is beyond the scope of this site, I've included some basic introductory material on both topics, as well as pointers to further information (online and otherwise) on the sources and resources pages. Among these resources is a glossary explaining "Who's Who and What's What in Arthurian Legend." I have opted not to have links to this page from every reference to Arthur, Merlin, et al, within the other pages; however, if one does come across an unfamiliar character or concept, it will likely be explained in the glossary. A word about my use of tense: While I'm aware that correct usage dictates the use of present tense when describing events in works of narrative art, this often yields awkward results when one is discussing a fictional character's "career" which may span several decades and a variety of publications. The use of past tense to describe the "histories" of such characters has become something of a convention in writing about comics. In these pages, I have generally used present tense when describing events in essentially self-contained works (such as Camelot 3000, or Batman: Dark Knight of the Round Table) and past tense when relating incidents in the ongoing sagas of series characters (such as the Black Knight or, again, Batman). Incidentally, for anyone curious about the use of the phrase "four colors" in the site title, the reference is to the four colors of the CMYK separation system that has been used to print the majority of color comics in the United States. The colors are: Cyan, Magenta, Yellow and blacK. These colors, mixed together in different ratios and different color screen densities, provide the range of colors seen in most of the images included on this site. For many older comics fans (or fans of older comics), "four colors" will call to mind Dell Publishing's long-running Four Color series, which included several Arthurian stories described on these pages. These pages are intended for educational, informational, and entertainment purposes and are entirely non-profit. The author has no comics or other materials to sell, and no official relationship with the publishers or creators of any of the intellectual properties discussed on these pages, nor any claims to ownership of the same intellectual properties, should be inferred. Copyrights of all illustrations are held by their respective owners, and will be removed from the site by request of the rightful owners. The author reserves all rights to the text. 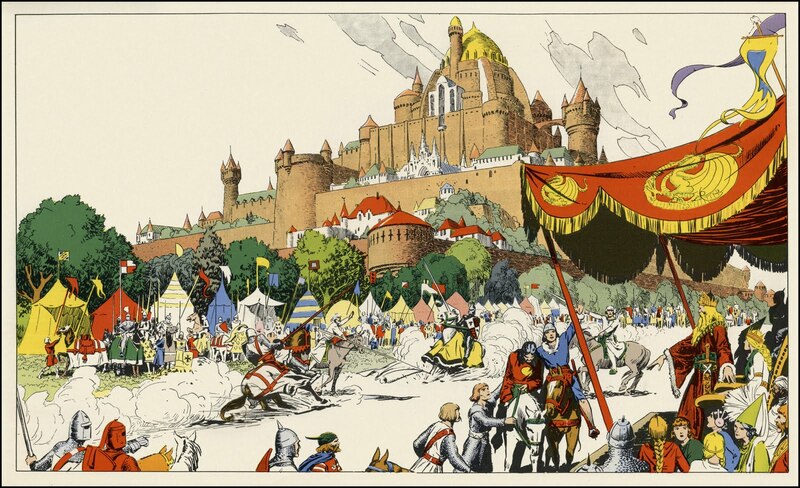 Illustration by Hal Foster from "Prince Valiant," King Features Syndicate, 1937.